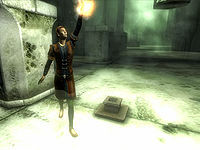 Carandial, an Altmer mage, is an Associate of the Mages Guild. 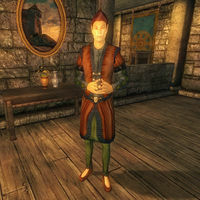 He is an avid Ayleid history scholar and researcher and is lucky to have the ruin of Anutwyll so close to the city walls. He studies the ruins regularly, using the camp he has set up nearby as a base. 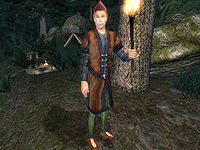 On most days, he wakes at 6am and wanders around his house for two hours before heading to the Mages Guild Hall. Between 8am and 8pm he spends his time looking for Ardaline or Delphine Jend, or just walking around the ground floor. He takes a break at midday and heads to Silverhome on the Water for a two-hour lunch break. At 8pm, he once again leaves to eat dinner at Silverhome then heads for his house, where he wanders for two hours before going to bed at midnight. On the 2nd of each month, and again on the 16th, Carandial skips sleep to ride up to Anutwyll on his Bay Horse. He will wander near his camp until 8am when he plunges inside the ruin to explore. He is searching for melee weapons worth at least 10 gold (anything except rusty weapons), and is likely to be disappointed since the inhabitants are animals and almost none of them wield weapons: this typically means he spends the entire trip standing just inside the doorway. He emerges at 4pm, and returns to his camp for some more wandering. The next day he will follow the same schedule before finally returning to Bravil at midnight on the third day. When you approach him for the first time, he won't hesitate telling you about his interest in the ancient ancestors: "Carandial. Mage-trained. Scholar by inclination. Student of our Aldmeri ancestors, the Ayleids." When asked about Bravil, he will comment that "The Ayelid [sic] ruin of Anutwyll is nearby. I can spend a few days on site, then return here for the comforts of home and my library," pronouncing "Ayleid" wrong. He wears a middle-class outfit consisting of a russet felt outfit and a pair of russet felt shoes. He also carries a leveled amount of gold and the key to his house. He doesn't carry any weapons, unless he finds one during his explorations, relying instead on a set of leveled mage spells. It is possible, especially at higher levels, for him to get killed by enemies while camping out in the wilderness or exploring the ruin. He has a bad habit of parking his horse in the middle of the bridge leading to Bravil. Although it can obstruct the way, you will know for sure that he is in town. Carandial is supposed to eat dinner at his camp from 8pm to 10pm during his excursion, and sleep there between midnight and 6am. Neither action takes place because the two AI packages responsible check to see if he is in Anutwyll, and never get chosen.